Posted By:Unknown | At:11:30 PM Be the first to comment! TALLAHASSEE, Fla. (AP) — Florida A&M University, which has been rocked by a hazing scandal for nearly a year, insists in legal papers filed Monday that it is not to blame for the tragic death last year of drum major Robert Champion. The university maintained that it was Champion, not the school, who bears the ultimate responsibility for his death. Champion died last November after he was beaten by fellow members of the famed Marching 100 band aboard a charter bus parked outside an Orlando hotel. The university asserts that the 26-year-old Champion was a top leader in the band and he should have refused to take part in the hazing ritual. “No public university or college has a legal duty to protect an adult student from the result of their own decision to participate in a dangerous activity while off-campus and after retiring from university-sponsored events,” states the lengthy filing by Richard Mitchell, an attorney with the GrayRobinson law firm hired by FAMU. Instead, the university maintains that Champion — who it says witnessed others being hazed that night on the bus — consented to the hazing ritual in order to gain respect among fellow band members. 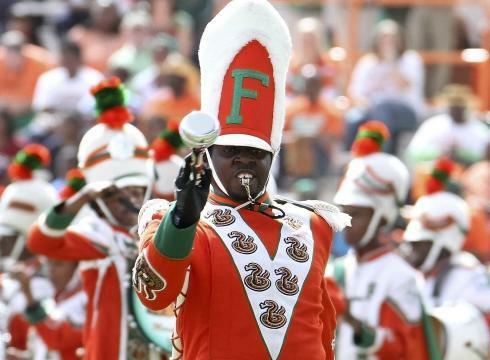 Because of that, FAMU wants a judge to throw out the lawsuit filed against the university by Champion’s family or at least delay action on it until criminal charges against Marching 100 band members are resolved. The family also sued the owner and driver of the charter bus where the ritual took place. “Under these circumstances, Florida’s taxpayers should not be held financially liable to Mr. Champion’s estate for the ultimate result of his own imprudent, avoidable and tragic decision and death,” states the motion filed by the university. The legal filing represents the first formal response that the university has made in the wake of Champion’s death, which led to arrests of band members, the suspension of the famed band for this football season and the resignation of the school’s president. Twelve former members have pleaded not guilty to charges of felony hazing. The suit was brought by Champion’s parents, Robert and Pamela Champion of Decatur, Ga. University trustees had discussed trying to mediate the lawsuit, but FAMU’s response may have doomed that effort. Chris Chestnut, the attorney representing the Champion family, said the lawsuit needs to go forward so that the university is held accountable for tolerating a culture of hazing that went unchecked for years. The Champions claim university officials did not take action to stop hazing even though a school dean proposed suspending the band because of hazing three days before their son died. In its response the university denied that any specific proposal or recommendation was made regarding suspending the band prior to Champion’s death. The Champion lawsuit also noted that school officials allowed nonstudents to play in the band and asserts that school officials fell short in enforcing anti-hazing policies and did not keep a close eye on band members to prevent hazing. The university in the last several months has instituted a long list of new policies, including limiting the Marching 100 to just FAMU students and putting in new academic policies. Beginning in spring 2013, students will be required to sign an anti-hazing pledge before they’re allowed to register for classes. The State University System of Florida still has a pending probe into whether university officials had ignored past warnings about problems with hazing at FAMU. Hundreds of pages of records reviewed earlier this year by the Associated Press showed years of repeated warnings about brutal hazing passed without any serious response from the school’s leadership until Champion died.